After Teaming up with Lisa Yates on her chicken project I found myself flowing with a lot of ideas in regards to the direction of the project. We discussed taking the project back a few steps from where it was at the time as neither of us were certain of what was going on or whether the idea felt any good. I suggested ideas far from the original pitch, though some of these directions with older characters or different settings and moods didn’t quite work, it helped both of us to understand what direction we’re both aiming for. The goal of exploring completely different directions and wacky ideas was not only to find what works, but to rule out what does not work, this way we can both find various ideas we can both relate to. Through some exploration we came to a settlement on a story to do with animal companionship. Lisa has had pets her whole life, so this worked well for her to relate to and myself, well I’ve recently gotten my first puppy, which has been an emotional experience I was unaware I’d be capable of. Though I am not a hugely pet person, I’ve definitely grown to understand what it is about pets that people love so much. Thus after some amount of discussion we’re able to agree and see through an idea that we both have experience with, experience that is invaluable to creating a believable story and goes in a direction that we can both agree upon. Establishing a theme and an emotional narrative that we’re both happy to proceed with is only the beginning. 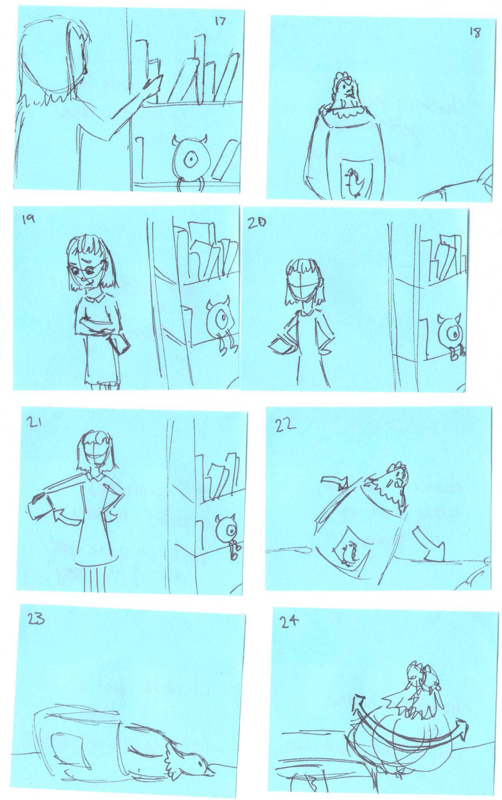 Me and Lisa have sat down, got out sticky notes and began to draw up shot and narrative progression ideas. 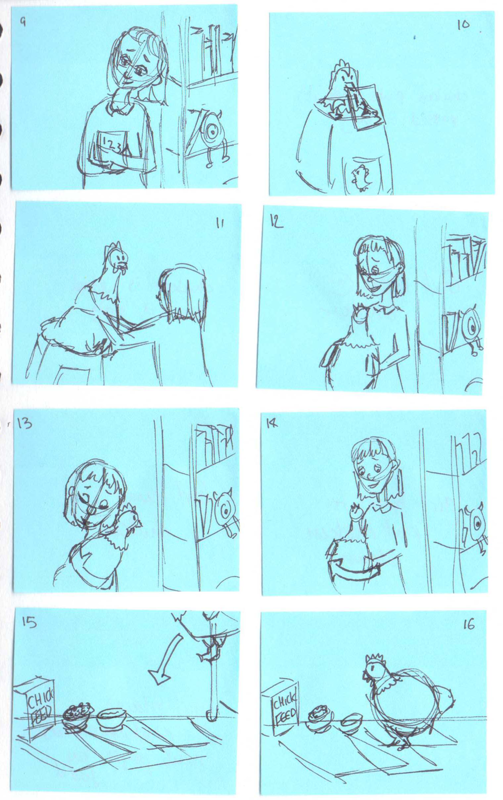 To help build a feel for the characters and their relationship to each other we started with boarding an introductory sequence, purely from a narrative perspective. i.e. establishing shots not showing what may be actual environment and rather placeholder. 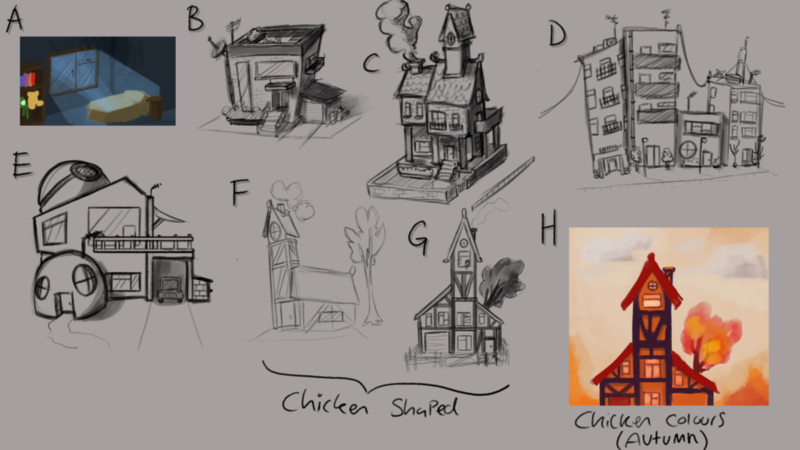 Of course, there is an drive to draw particular locations and elements based on what our initial ideas are. 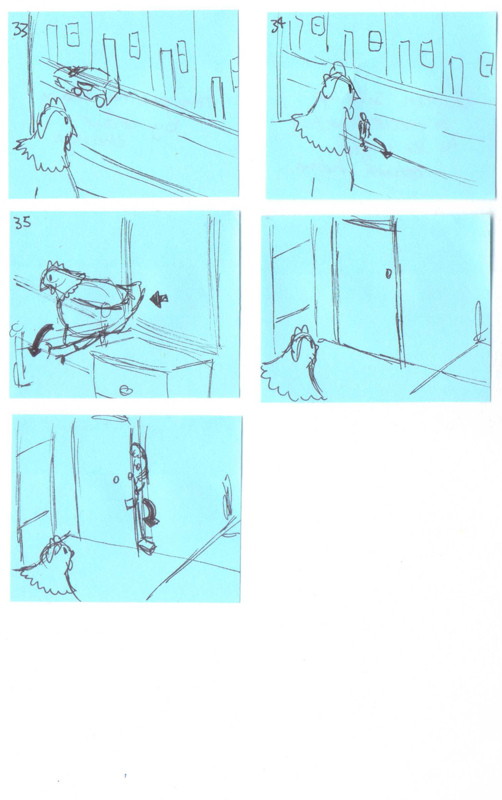 As we drew various shots for different events, we found that we both had slightly different takes on how we’d board them, in some cases the way we’ve interpreted each others frames has changed the action we’d initially intended. 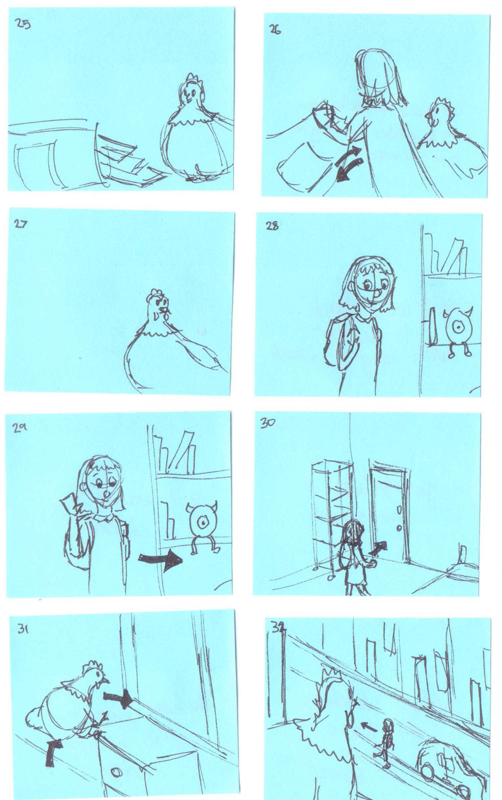 In the sequence to the right we have the location introduced and our character is packing her rucksack ready for school. We’ve used this as a way to introduce the relationship that the character and her chicken have by them working together. 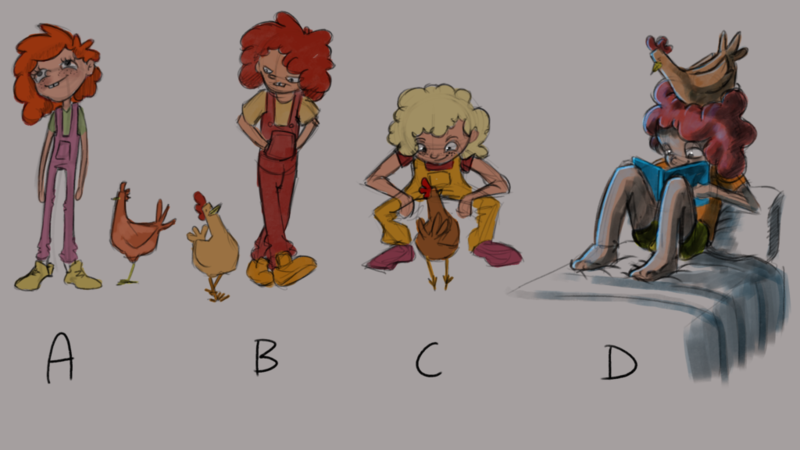 With some further design work we’ll be able to tell a lot about the character through the elements in her room and the personality of the chicken really begins to show as we discuss and explore how they interact. The story begins to lend itself towards an element of jealousy as we see the chicken discard the girls toy and jump in the rucksack. I was unsure of what to do next in regards to exploring the project so I began sketching her home and where she might live. I started with my gut reaction, and began to explore other designs that came to my mind. Letting my hand draw whatever comes to my mind initially felt like a really good way to relax with the project and let it take its own direction, as I started to sketch a few more locations I began to think deeper and explore further. I began to question what elements I could bring in that relate to the idea, the first thought was using shape language and using the shape of a chicken to create a home that somewhat resembles the shape. I used a tree in the back garden to represent the tail feathers and a wide base with a tower for the body and head. Furthermore I realised I needed to think of colour so, I thought Chicken colours and also considered how seasons affect the mood, combining these I created an autumn mood board and colour picked one of the images to create a colour key of the rough chicken house I designed. To further push the project I started to explore character designs, I used Lisa’s character concepts for inspiration as I am not as well versed in young girls fashion or hairstyles and I really liked the elements Lisa had been bringing to the table. I knew that if I was to try and capture the girls personality it would be integral that I sketch her with her chicken. 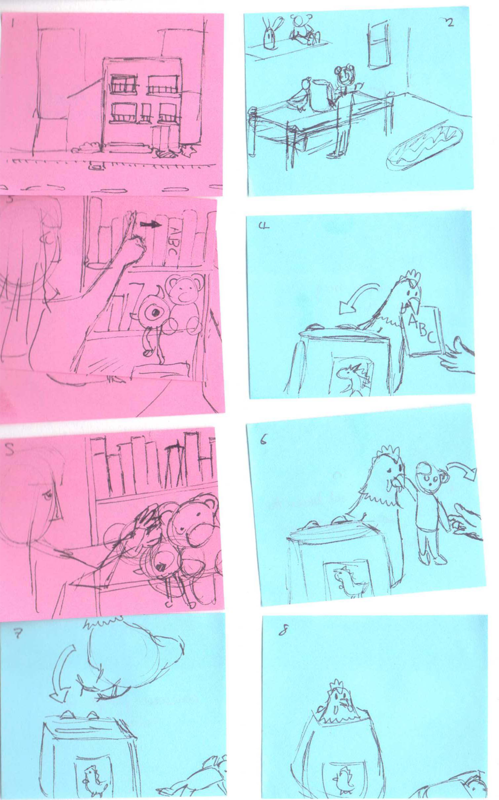 I proposed this idea of sketching her during an activity with her chicken to Lisa as not only does it provide much more visual information but I knew it would help push their relationship and create more dynamic imagery. Again, with her design I applied an autumn colour scheme, which upon doing so I also realised that her hair in my sketches almost resembles both the comb of the chicken and somewhat of a nest, which drove toward the idea of the chicken sat on her head. Progress has felt slow, but with all of the discussion and bouncing of ideas the project is starting kick off in a direction that we’re both enjoying. There’s still a way to go, but there’s definitely been a ton of problem solving and a path is revealing itself within the sand.